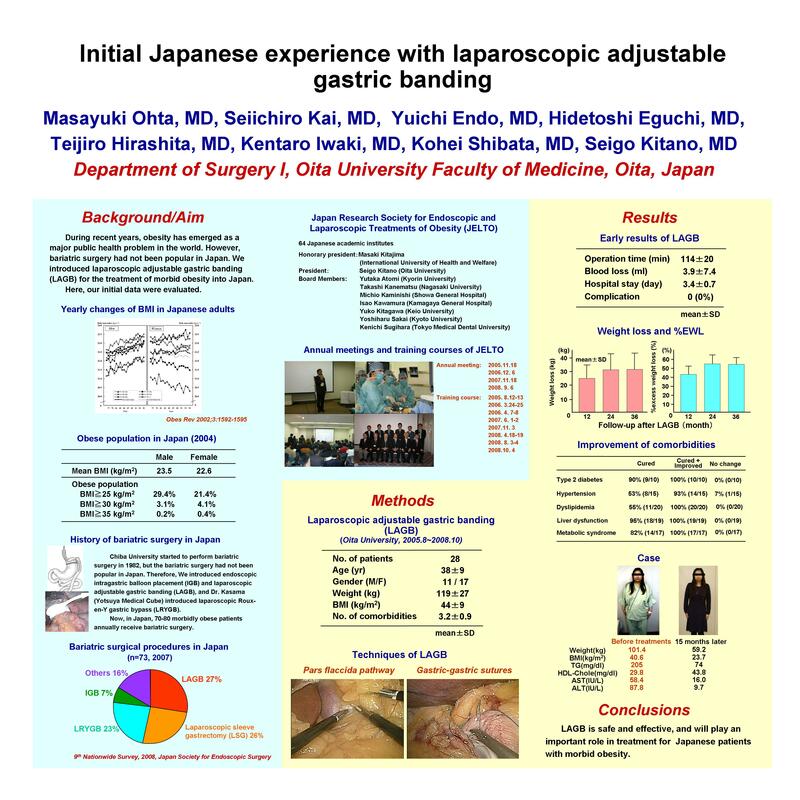 Background/Aim: Since bariatric surgery had not been so popular in Japan, we introduced laparoscopic adjustable gastric banding (LAGB) for the treatment of morbid obesity into Japan. Our initial data were evaluated. Methods: Between August 2005 and August 2008, 28 morbidly obese patients (17 women / 11 men, mean age of 38yr) received LAGB in our institute. All patients were morbidly obese (BMI>35 kg/m2), and the averaged weight was 119 kg and BMI was 44 kg/m2. In regard to LAGB devices, LAP-BAND (Allergan Medical) was used in 26 patients and SAGB (OBTECH Medical GmbH) in 2 patients. All procedures of LAGB were performed through the pars flaccida pathway with band fixation using gastric-to-gastric sutures. Results: All the procedures were completed laparoscopically, and no major complications were experienced. Weight loss and % excess weight loss on the average were 25 kg and 42% after 12 months, 32 kg and 55% after 24 months, and 31 kg and 64% after 36 months. These results were comparable to the previous published data. Accordingly, comorbidities were frequently improved, and type 2 diabetes and metabolic syndrome were cured in 9 of 10 patients (90%) and in 12 of 16 patients (75%), respectively. Conclusions: LAGB is safe and effective, and will play an important role in treatment for morbid obesity in Japan.